Leading scientist in the field of radon research, Dr Emilie van Deventer of the World Health Organisation gave a keynote address at a recent conference about the health burden that radon presents worldwide. 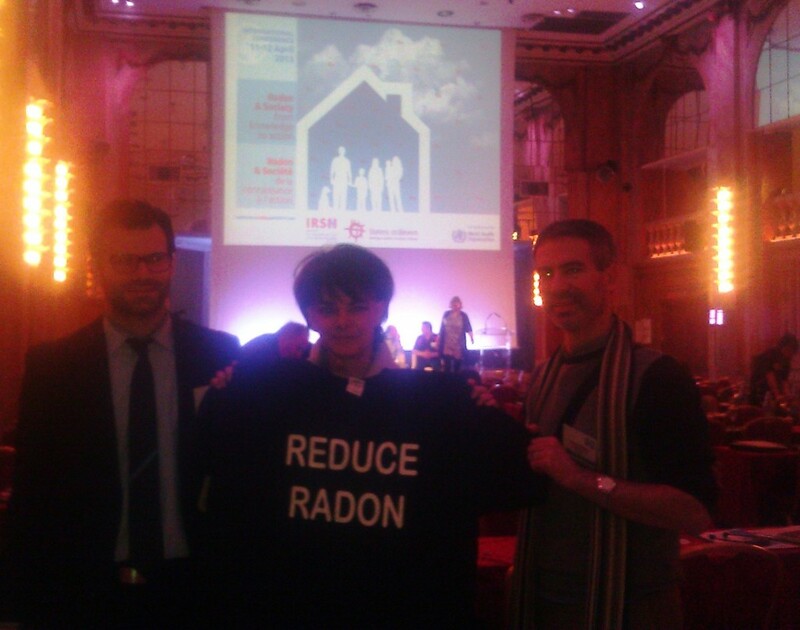 At the ‘Radon & Society’ conference in Paris, Dr van Deventer explained how the World Health Organisation (WHO) is tackling radon as an international problem and encouraging individual countries to refine their policies regarding action levels and preventative measures for new buildings. A new study published in The Lancet examined a plethora of risk factors that are posed worldwide, including issues as diverse as high blood pressure and raised cholesterol levels to poor sanitation and alcohol abuse. The study revealed that in Western Europe, residential radon exposure was the 27th greatest risk factor posed to inhabitants. Dr van Deventer also stressed the importance of increasing public awareness and perception of the risk, and so was pleased to support the Radon Tee World Trek campaign. Also keen to support the campaign was Dr Tony Geryes (left) of IRSN (Institut de radioprotection et de sûreté nucléaire / Institute of Radioprotection and Nuclear Safety) who organised the conference and Fabrice Guyard (right) from the City of Nante Public Health department. Mr Guyard explained how a radon testing programme had commenced in 2010 and found that 27% of homes that were tested were above the recommended level and that a number of schools and nurseries also required remediation.